With many West Marin residents wishing the “war” would end, more than 300 people as of Monday evening had signed a petition calling for both sides to get together and work out their differences. The dispute went public a month ago when Citizen owner Joel Hack published an “Extra” edition accusing Marin Media Institute, the nonprofit that had just bought The Light, of attempting a “hostile takeover.” The edition said that MMI was trying to take advantage of Joel’s personal financial problems to gain control of The Citizen. Joel is married to Kathie Simmons, an attorney in Sonoma County. Kathie, who does business as a one-attorney law firm, had to dip into her IRA several times in recent years to cover business expenses. The problem, Joel told me, was that because she was under 59 and 1/2, she had to pay penalties for the early withdrawals. Without the funds to pay the penalties and failing to file some tax returns in a timely manner, the couple saw their initial debt of $4,000 to $5,000 to the IRS and the State Franchise Tax Board balloon to $26,000. On Feb. 26, Joel and Kathie filed for Chapter 13 protection (from creditors) under US Bankruptcy laws. They then began paying off their back state and federal income taxes at the rate of $600 a month. Under Chapter 13, they could do this over 36 months without incurring additional penalties. However, MMI’s attorney Doug Ferguson then notified the bankruptcy trustee that the nonprofit had negotiated unsuccessfully to buy The Citizen and would still be willing to buy the paper if the trustee liked the idea. Citing attorney Ferguson’s letter, the bankruptcy trustee last month recommended the bankruptcy court convert Joel’s and Kathie’s Chapter 13 (individual bankruptcy) to Chapter 7 (possible liquidation) or Chapter 11 (reorganization). MMI now says it later told the trustee — when he asked — that the nonprofit was no longer interested in buying The Citizen. But the damage had been done. Faced with either Chapter 7 or Chapter 11, Joel and Kathie have now voluntarily dismissed their bankruptcy protection, and Joel told me he will dip into his own IRA to pay off their debts. Among those people is Nancy Bertelsen, who has long been active in West Marin civic affairs, especially those involving the arts. On Friday she emailed me a petition that was also sponsored by six other people who are likewise prominent around Point Reyes Station: Steve Costa, Chris Giacomini, Michael Mery, Claire Peaslee, Jonathan Rowe, and Murray Suid. “Prompted by the difficulties between our two weekly newspapers, those of us listed [above] met to discuss how we could encourage the owners of the papers to unite in some way for the good of the community,” the cover letter said. “There is broad interest in West Marin in the emergence of a single newspaper that serves us all. The current competition between two weekly papers is not working. It forces both to struggle—journalistically and financially — and it strains the loyalties and resources of advertisers, readers and contributors alike. We urge that you end this situation, which is depriving the community of the strong, stable paper we need. “Both papers exist to serve the community. The owners of both are clearly committed to that purpose. But the current situation is working against what both papers want to achieve, and against the best interests of West Marin. Readers and advertisers are weary and do not want this fractured situation to continue. We want a unified community. “Specifically, we urge the owners of both papers and their representatives to begin an open discussion to work out a more positive relationship than is the case now. Using the services of a mediator would probably be helpful. A new relationship might include a merger of the two papers or any number of agreements that have not been imagined before now but that would be mutually beneficial. “In any case, negotiations should be without conditions or preconceptions, and with neither recriminations nor need for apologies on either side. Instead, we call upon you to start fresh and seek a way forward, to restore the vitality and viability of West Marin’s local media. The petition caught me by surprise, but I’ve signed it, and I urge other West Marin residents to do the same so we can quiet down the fighting. It’s easy. Just click on http://www.westmarinblog.org/ and type in your name and hometown. The web page includes a list of people who have already signed. Update: On July 22, The West Marin Citizen printed the cover letter, the petition, the names of its sponsors, and the names of the more than 300 people who signed it. 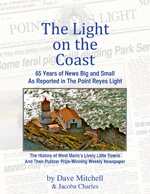 The Point Reyes Light the same day published the cover letter and names of the sponsors but neither the petition nor the 300 signatures. I would feel much better about the MMI if they quit acting like lawyers trying their questionable case in the national media and address the issues to their intended readership directly in their Point Reyes Light. I’m also concerned about their reported interest in absorbing KWMR. And I, too, signed the petition. I cannot sign this petition. I want The Citizen. I do not want these other people, whom I know nothing about. I am trying to figure out how they could even come together, after what they tried to do to Joel Hack. Like I have said before, Dave Mitchell made The Light a Pulitzer Prize Paper, not Tess, whom they want to be Solely in charge of The Light. How could anyone think you can merge these 2 papers together? That would mean there would be No Citizen (because they want Tess to be in charge) and they would fire and belittle everyone who works for and contributes to The Citizen. Sparsely Sage and Timely is powered by	WordPress 4.9.10 and delivered to you in 0.680 seconds using 50 queries.